What if it were possible to observe the fundamental building blocks upon which the Universe is based? Not a problem! All you would need is a massive particle accelerator, an underground facility large enough to cross a border between two countries, and the ability to accelerate particles to the point where they annihilate each other – releasing energy and mass which you could then observe with a series of special monitors. Well, as luck would have it, such a facility already exists, and is known as the CERN Large Hardron Collider (LHC), also known as the CERN Particle Accelerator. Measuring roughly 27 kilometers in circumference and located deep beneath the surface near Geneva, Switzerland, it is the largest particle accelerator in the world. And since CERN flipped the switch, the LHC has shed some serious light on some deeper mysteries of the Universe. Colliders, by definition, are a type of a particle accelerator that rely on two directed beams of particles. Particles are accelerated in these instruments to very high kinetic energies and then made to collide with each other. The byproducts of these collisions are then analyzed by scientists in order ascertain the structure of the subatomic world and the laws which govern it. The purpose of colliders is to simulate the kind of high-energy collisions to produce particle byproducts that would otherwise not exist in nature. What’s more, these sorts of particle byproducts decay after very short period of time, and are are therefor difficult or near-impossible to study under normal conditions. The term hadron refers to composite particles composed of quarks that are held together by the strong nuclear force, one of the four forces governing particle interaction (the others being weak nuclear force, electromagnetism and gravity). The best-known hadrons are baryons – protons and neutrons – but also include mesons and unstable particles composed of one quark and one antiquark. The LHC operates by accelerating two beams of “hadrons” – either protons or lead ions – in opposite directions around its circular apparatus. The hadrons then collide after they’ve achieved very high levels of energy, and the resulting particles are analyzed and studied. It is the largest high-energy accelerator in the world, measuring 27 km (17 mi) in circumference and at a depth of 50 to 175 m (164 to 574 ft). The tunnel which houses the collider is 3.8-meters (12 ft) wide, and was previously used to house the Large Electron-Positron Collider (which operated between 1989 and 2000). This tunnel contains two adjacent parallel beamlines that intersect at four points, each containing a beam that travels in opposite directions around the ring. The beam is controlled by 1,232 dipole magnets while 392 quadrupole magnets are used to keep the beams focused. About 10,000 superconducting magnets are used in total, which are kept at an operational temperature of -271.25 °C (-456.25 °F) – which is just shy of absolute zero – by approximately 96 tonnes of liquid helium-4. This also makes the LHC the largest cryogenic facility in the world. When conducting proton collisions, the process begins with the linear particle accelerator (LINAC 2). After the LINAC 2 increases the energy of the protons, these particles are then injected into the Proton Synchrotron Booster (PSB), which accelerates them to high speeds. They are then injected into the Proton Synchrotron (PS), and then onto the Super Proton Synchrtron (SPS), where they are sped up even further before being injected into the main accelerator. Once there, the proton bunches are accumulated and accelerated to their peak energy over a period of 20 minutes. Last, they are circulated for a period of 5 to 24 hours, during which time collisions occur at the four intersection points. During shorter running periods, heavy-ion collisions (typically lead ions) are included the program. The lead ions are first accelerated by the linear accelerator LINAC 3, and the Low Energy Ion Ring (LEIR) is used as an ion storage and cooler unit. The ions are then further accelerated by the PS and SPS before being injected into LHC ring. While protons and lead ions are being collided, seven detectors are used to scan for their byproducts. These include the A Toroidal LHC ApparatuS (ATLAS) experiment and the Compact Muon Solenoid (CMS), which are both general purpose detectors designed to see many different types of subatomic particles. Then there are the more specific A Large Ion Collider Experiment (ALICE) and Large Hadron Collider beauty (LHCb) detectors. Whereas ALICE is a heavy-ion detector that studies strongly-interacting matter at extreme energy densities, the LHCb records the decay of particles and attempts to filter b and anti-b quarks from the products of their decay. Then there are the three small and highly-specialized detectors – the TOTal Elastic and diffractive cross section Measurement (TOTEM) experiment, which measures total cross section, elastic scattering, and diffractive processes; the Monopole & Exotics Detector (MoEDAL), which searches magnetic monopoles or massive (pseudo-)stable charged particles; and the Large Hadron Collider forward (LHCf) that monitor for astroparticles (aka. cosmic rays). CERN, which stands for Conseil Européen pour la Recherche Nucléaire (or European Council for Nuclear Research in English) was established on Sept 29th, 1954, by twelve western European signatory nations. The council’s main purpose was to oversee the creation of a particle physics laboratory in Geneva where nuclear studies would be conducted. Soon after its creation, the laboratory went beyond this and began conducting high-energy physics research as well. It has also grown to include twenty European member states: France, Switzerland, Germany, Belgium, the Netherlands, Denmark, Norway, Sweden, Finland, Spain, Portugal, Greece, Italy, the UK, Poland, Hungary, the Czech Republic, Slovakia, Bulgaria and Israel. Construction of the LHC was approved in 1995 and was initially intended to be completed by 2005. However, cost overruns, budget cuts, and various engineering difficulties pushed the completion date to April of 2007. The LHC first went online on September 10th, 2008, but initial testing was delayed for 14 months following an accident that caused extensive damage to many of the collider’s key components (such as the superconducting magnets). 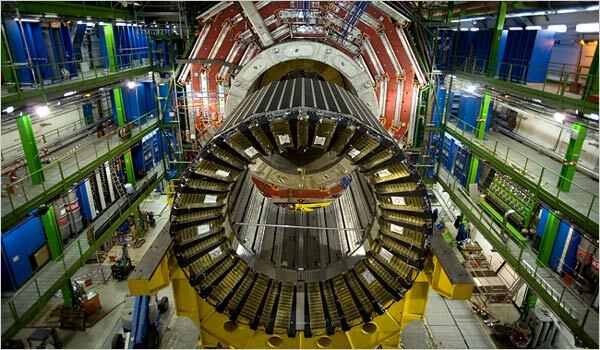 On November 20th, 2009, the LHC was brought back online and its First Run ran from 2010 to 2013. During this run, it collided two opposing particle beams of protons and lead nuclei at energies of 4 teraelectronvolts (4 TeV) and 2.76 TeV per nucleon, respectively. The main purpose of the LHC is to recreate conditions just after the Big Bang when collisions between high-energy particles was taking place. During its First Run, the LHCs discoveries included a particle thought to be the long sought-after Higgs Boson, which was announced on July 4th, 2012. This particle, which gives other particles mass, is a key part of the Standard Model of physics. Due to its high mass and elusive nature, the existence of this particle was based solely in theory and had never been previously observed. The discovery of the Higgs Boson and the ongoing operation of the LHC has also allowed researchers to investigate physics beyond the Standard Model. This has included tests concerning supersymmetry theory. The results show that certain types of particle decay are less common than some forms of supersymmetry predict, but could still match the predictions of other versions of supersymmetry theory. In May of 2011, it was reported that quark–gluon plasma (theoretically, the densest matter besides black holes) had been created in the LHC. On November 19th, 2014, the LHCb experiment announced the discovery of two new heavy subatomic particles, both of which were baryons composed of one bottom, one down, and one strange quark. The LHCb collaboration also observed multiple exotic hadrons during the first run, possibly pentaquarks or tetraquarks. Since 2015, the LHC has been conducting its Second Run. In that time, it has been dedicated to confirming the detection of the Higgs Boson, and making further investigations into supersymmetry theory and the existence of exotic particles at higher-energy levels. In the coming years, the LHC is scheduled for a series of upgrades to ensure that it does not suffer from diminished returns. In 2017-18, the LHC is scheduled to undergo an upgrade that will increase its collision energy to 14 TeV. In addition, after 2022, the ATLAS detector is to receive an upgrade designed to increase the likelihood of it detecting rare processes, known as the High Luminosity LHC. The collaborative research effort known as the LHC Accelerator Research Program (LARP) is currently conducting research into how to upgrade the LHC further. Foremost among these are increases in the beam current and the modification of the two high-luminosity interaction regions, and the ATLAS and CMS detectors. Who knows what the LHC will discover between now and the day when they finally turn the power off? 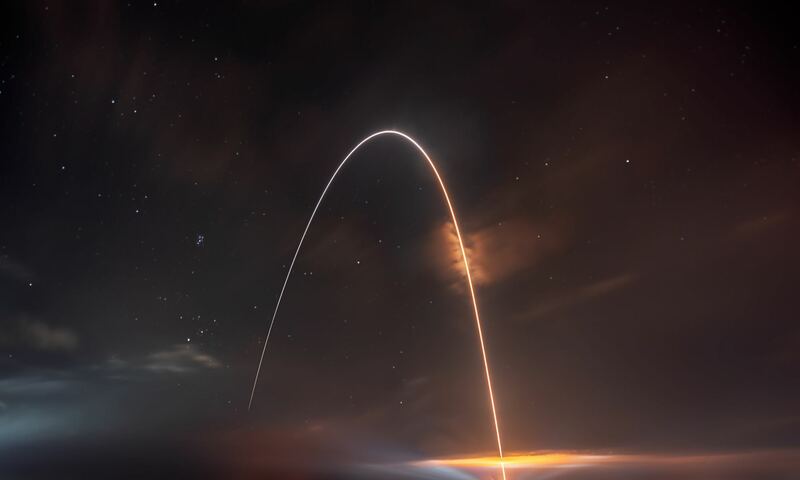 With luck, it will shed more light on the deeper mysteries of the Universe, which could include the deep structure of space and time, the intersection of quantum mechanics and general relativity, the relationship between matter and antimatter, and the existence of “Dark Matter”. We have written many articles about CERN and the LHC for Universe Today. Here’s What is the Higgs Boson?, The Hype Machine Deflates After CERN Data Shows No New Particle, BICEP2 All Over Again? Researchers Place Higgs Boson Discovery in Doubt, Two New Subatomic Particles Found, Is a New Particle about to be Announced?, Physicists Maybe, Just Maybe, Confirm the Possible Discovery of 5th Force of Nature. 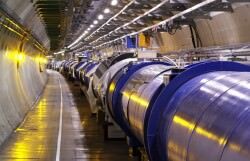 If you’d like more info on the Large Hadron Collider, check out the LHC Homepage, and here’s a link to the CERN website. Astronomy Cast also has some episodes on the subject. Listen here, Episode 69: The Large Hadron Collider and The Search for the Higgs Boson and Episode 392: The Standard Model – Intro. This summer in Chicago, from August 3rd until the 10th, theorists and experimental physicists from around the world will be participating in the International Conference of High Energy Physics (ICHEP). One of the highlights of this conference comes from CERN Laboratories, where particle physicists are showcasing the wealth of new data that the Large Hadron Collider (LHC) has produced so far this year. But amidst all the excitement that comes from being able to peer into the more than 100 latest results, some bad news also had to be shared. Thanks to all the new data provided by the LHC, the chance that a new elementary particle was discovered – a possibility that had begun to appear likely eight months ago – has now faded. Too bad, because the existence of this new particle would have been groundbreaking! The indications of this particle first appeared back in December of 2015, when teams of physicists using two of CERN’s particle detectors (ATLAS and CMS) noted that the collisions performed by the LHC were producing more pairs of photons than expected, and with a combined energy of 750 gigaelectronvolts. While the most likely explanation was a statistical fluke, there was another tantalizing possibility – that they were seeing evidence of a new particle. If this particle were in fact real, then it was likely to be a heavier version of the Higgs boson. This particle, which gives other elementary particles their mass, had been discovered in 2012 by researchers at CERN. But whereas the discover of the Higgs boson confirmed the Standard Model of Particle Physics (which has been the scientific convention for the past 50 years), the possible existence of this particle was inconsistent with it. Another, perhaps even more exciting, theory was that the particle was the long-sought-after gravitron, the theoretical particle that acts as the “force carrier” for gravity. If indeed it was this particle, then scientists would finally have a way for explaining how General Relativity and Quantum Mechanics go together – something that has eluded them for decades and inhibited the development of a Theory of Everything (ToE). For this reason, there has been a fair degree of excitement in the scientific community, with over 500 scientific papers produced on the subject. However, thanks to the massive amounts of data provided in the past few months, the CERN researchers were forced to announce on Friday at ICEP 2016 that there was no new evidence of a particle to be had. The results were presented by representatives of the teams that first noticed the unusual data last December. Representing CERN’s ATLAS detector, which first noted the photon pairs, was Bruno Lenzi. Meanwhile, Chiara Rovelli representing the competing team that uses the Compact Muon Solenoid (CMS), which confirmed the readings. This was all disappointing news, since the discovery of a new particle could have shed some light on the many questions arising out of the discovery of the Higgs boson. Ever since it was first observed in 2012, and later confirmed, scientists have been struggling to understand how it is that the very thing that gives other particles their mass could be so “light”. Despite being the heaviest elementary particle – with a mass of 125 billion electron volts – quantum theory predicted that the Higgs boson had to be trillions of times heavier. In order to explain this, theoretical physicists have been wondering if in fact there are some other forces at work that keep the Higgs boson’s mass at bay – i.e. some new particles. While no new exotic particles have been discovered just yet, the results so far have still been encouraging. For instance, they showed that LHC experiments have already recorded about five times more data in the past eight months than they did in all of last year. They also offered scientists a glimpse of how subatomic particles behave at energies of 13 trillion electronvolts (13 TeV), a new level that was reached last year. This energy level has been made possible from the upgrades performed on the LHC during its two-year hiatus; prior to which, it was functioning at only half-power. Another thing worth bragging about was the fact that the LHC surpassed all previous performance records this past June, reaching a peak luminosity of 1 billion collisions per second. Being able to conduct experiments at this energy level, and involving this many collisions, has provided LHC researchers with a large enough data set that they are able to conduct more precise measurements of Standard Model processes. In particular, they will be able to look for anomalous particle interactions at high mass, which constitutes an indirect test for physics beyond the Standard Model – specifically new particles predicted by the theory of Supersymmetry and others. And while they have yet to discover any new exotic particles, the results so far have still been encouraging, mainly because they show that the LHC is producing more results than ever. For the time being, it seems we are all going to have to be patient and wait on more scientific results to be produced. And we can all take solace in the fact that, at least for now, the Standard Model still appears to be the correct one. Clearly, there are no short cuts when it comes to figuring out how the Universe works and how all its fundamental forces fit together. What is this thing we keep hearing about – the Higgs Boson, and why is it important? All fundamental particles are either fermions or bosons. Last week we talked about quarks, which are fermions. This week we’ll talk about bosons, including the famous Higgs boson, recently confirmed by the Large Hadron Collider. What if a Black Hole Met an Antimatter Black Hole? Would shooting a black hole into an antimatter black hole destroy them both? Could You Put a Black Hole in Your Pocket? How small do black holes get? Could you carry one around in your pocket? Does that even like a sane thing to do? I’m pleased to announce that the Large Hadron Collider, the enormous particle accelerator in Europe has begun operations again with twice the colliding power. Smashing atoms with 15 Tera-electron volts. The LHC double-down has a laundry list of science to get done, like determining the nature of dark matter, searching for particles to confirm the theory of supersymmetry, and probing the Universe for extra dimensions. One of its tasks will be to search for Hawking Radiation, the stream of particles that come out of black holes as they evaporate. So, in order to watch them evaporate, the LHC is going to try and create little tiny black holes. We only know one natural process for creating black holes: the death of massive stars as supernova. Oh, and whatever it took to make supermassive black holes – that’s still pretty much a mystery. As a side note, we are going to be supermassively embarrassed if it turns out they’re created by species messing with forces far beyond their comprehension by doubling the power at their biggest particle accelerator, and turning their region of the Universe into a giant mess. Clean up, aisle Milky Way. Apparently, you could get a black hole of any size, even microscopic. If you took the mass of the Earth, compressed it down to the size of a marble, it would become a black hole. A black hole with the mass of the Earth. The only place this might have been possible was at the very beginning of the Universe, shortly after the Big Bang. When the Universe was unimaginably hot and dense, there were tiny fluctuations of density, nooks in spacetime where tiny black holes might have formed. Maybe they don’t exist at all, the conditions of the early Universe didn’t bring them about. It’s just a theory. A theory that the Large Hadron Collider will try to confirm or deny. The important question is, will it kill us all? Could a black hole fall out of the experiment, and roll down into the sewer drain. Chewing its way down into the center of the Earth, gobbling away the core of the planet, eventually creating an Earth-massed black hole? Here’s the good news. The less massive, the hotter it is, and the faster it evaporates. Microscopic black holes would evaporate in a faction of a second. Any that the LHC could create, would disintegrate in a faction of a second. In fact, they should be gone in 10^-27 seconds. So it turns out, you could put a black hole in your pocket. An Earth-mass black hole would fit nicely in your pocket. An Earth’s worth of gravity, however, could prove problematic. Fortunately, there’s no natural process that can create these objects, and any black holes that we could create would be gone before you could get them anywhere near a pocket. So, you should probably stop thinking of it in terms of one of Lord Nibbler’s doodies. What would you do with a pocket-sized black hole? Tell us in the comments below. Nothing lasts forever, not even black holes. According to Stephen Hawking, black holes will evaporate over vast periods of time. But how, exactly, does this happen? The actor Stephen Hawking is best known for his cameo appearances in Futurama and Star Trek, you might surprised to learn that he’s also a theoretical astrophysicist. Is there anything that guy can’t do? One of the most fascinating theories he came up with is that black holes, the Universe’s swiffer, can actually evaporate over vast periods of time. Quantum theory suggests there are virtual particles popping in and out of existence all the time. When this happens, a particle and its antiparticle appear, and then they recombine and disappear again. When this takes place near an event horizon, strange things can happen. Instead of the two particles existing for a moment and then annihilating each other, one particle can fall into the black hole, and the other particle can fly off into space. Over vast periods of time, the theory says that this trickle of escaping particles causes the black hole to evaporate. Wait, if these virtual particles are falling into the black hole, shouldn’t that make it grow more massive? How does that cause it to evaporate? If I add pebbles to a rock pile, doesn’t my rock pile just get bigger? It comes down to perspective. From an outside observer watching the black hole’s event horizon, it appears as if there’s a glow of radiation coming from the black hole. If that was all that was happening, it would violate the law of thermodynamics, as energy can neither be created nor destroyed. Since the black hole is now emitting energy, it needs to have given up a little bit of its mass to provide it. Let’s try another way to think about this. A black hole has a temperature. The more massive it is, the lower its temperature, although it’s still not zero. From now and until far off into the future, the temperature of the largest black holes will be colder than the background temperature of the Universe itself. Light from the cosmic microwave background radiation will fall in, increasing its mass. Now, fast forward to when the background temperature of the Universe drops below even the coolest black holes. Then they’ll slowly radiate heat away, which must come from the black hole converting its mass into energy. The rate that this happens depends on the mass. For stellar mass black holes, it might take 10^67 years to evaporate completely. 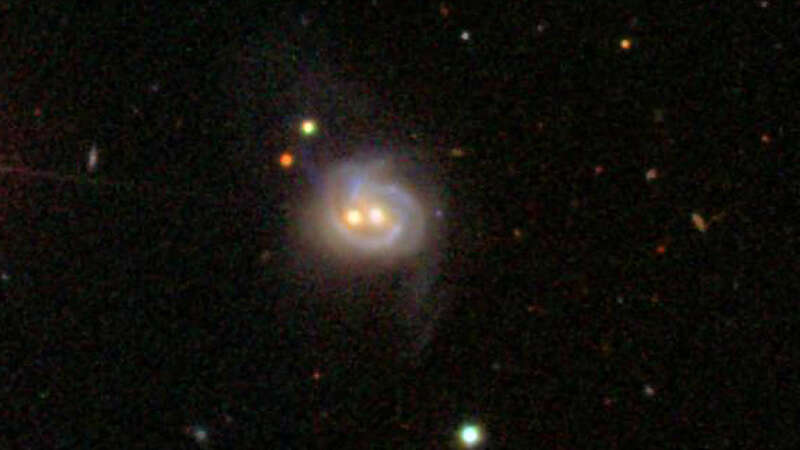 For the big daddy supermassive ones at the cores of galaxies, you’re looking at 10^100. That’s a one, followed by 100 zero years. That’s huge number, but just like any gigantic and finite number, it’s still less than infinity. So over an incomprehensible amount of time, even the longest living objects in the Universe – our mighty black holes – will fade away into energy. One last thing, the Large Hadron Collider might be capable of generating microscopic black holes, which would last for a fraction of a second and disappear in a burst of Hawking radiation. If they find them, then Hawking might want to the acting on hold and focus on physics. Nothing is eternal, not even black holes. Over the longest time frames we’re pretty sure they’ll evaporate away into nothing. The only way to find out is to sit back and watch, well maybe it’s not the only way. Does the idea of these celestial nightmares evaporating fill you with existential sadness? Feel free to share your thoughts with others in the comments below. Thanks for watching! Never miss an episode by clicking subscribe. Our Patreon community is the reason these shows happen. We’d like to thank Dana Nourie and the rest of the members who support us in making great space and astronomy content. Members get advance access to episodes, extras, contests, and other shenanigans with Jay, myself and the rest of the team. Want to get in on the action? Click here. How Do We Know Dark Matter Exists? Dark matter can’t be seen or detected by any of our instruments, so how do we know it really exists? Imagine the Universe was a pie, and you were going to slice it up into tasty portions corresponding to what proportions are what. The largest portion of the pie, 68% would go to dark energy, that mysterious force accelerating the expansion of the Universe. 27% would go to dark matter, the mysterious matter that surrounds galaxies and only interacts through gravity. A mere 5% of this pie would go to regular normal matter, the stuff that stars, planets, gas, dust, and humans are made out of. Dark matter has been given this name because it doesn’t seem to interact with regular matter in any way. It doesn’t collide with it, or absorb energy from it. We can’t see it or detect it with any of our instruments. We only know it’s there because we can see the effect of its gravity. Now, you might be saying, if we don’t know what this thing is, and we can’t detect it. How do we know it’s actually there? Isn’t it probably not there, like dragons? How do we know dark matter actually exists, when we have no idea what it actually is? Oh, it’s there. In fact, pretty much all we know is that it does exist. Dark matter was first theorized back in the 1930s by Fritz Zwicky to account for the movement of galaxy clusters, but the modern calculations were made by Vera Rubin in the 1960s and 70s. She calculated that galaxies were spinning more quickly than they should. So quickly that they should tear themselves apart like a merry-go-round ejecting children. Rubin imagined that every galaxy was stuck inside a vast halo of dark matter that supplied the gravity to hold the galaxy together. But there was no way to actually detect this stuff, so astronomers proposed other models. Maybe gravity doesn’t work the way we think it does at vast distances. But in the last few years, astronomers have gotten better and better at detecting dark matter, purely though the effect of its gravity on the path that light takes as it crosses the Universe. As light travels through a region of dark matter, its path gets distorted by gravity. Instead of taking a straight line, the light is bent back and forth depending on how much dark matter is passes through. And here’s the amazing part. Astronomers can then map out regions of dark matter in the sky just by looking at the distortions in the light, and then working backwards to figure out how much intervening dark matter would need to be there to cause it. These techniques have become so sophisticated that astronomers have discovered unusual situations where galaxies and their dark matter have gotten stripped away from each other. Or dark matter galaxies which don’t have enough gas to form stars. They’re just giant blobs of dark matter. Astronomers even use dark matter as gravitational lenses to study more distant objects. They have no idea what dark matter is, but they can still use it as a telescope. They’ve never captured a dark matter particle, and haven’t studied them in the lab. One of the Large Hadron Collider’s next tasks will be to try and generate particles that match the characteristics of dark matter as we understand it. Even if the LHC doesn’t actually create dark matter, it will help narrow down the current theories, hopefully helping physicists focus in on the true nature of this mystery. This is how science works. Someone notices something unusual, and then people propose theories to explain it. The theory that best matches reality is considered correct. We live in a modern world, where so many scientific theories have already been proven for hundreds of years: germs, gravity, evolution, etc. But with dark matter, you’re alive at a time when this is a mystery. And if we’re lucky, we’ll see it solved within our lifetime. Or maybe there’s no dark matter after all, and we’re about to learn something totally new about our Universe. Science, it’s all up to you. What do you think dark matter is? Tell us in the comments below.